All that rain and cool weather we were complaining about just days ago seems to have disappeared and been replaced with….how do you say it? Oh yeah, summer. And now everyone is complaining about the oppressive heat and humidity. But not my vegetable garden. No sirree! 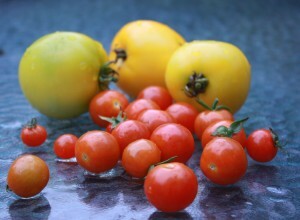 In fact all this heat is finally making my tomatoes blush. And all that rain? Well it made my herbs go haywire. As such the garden resembles more of a jungle than a cute backyard veggie patch. The sunflowers are towering over the tomatoes almost ready to burst with yellow blooms the size of dinner plates. The tomatoes look like something out of the Little Shop of Horrors–scratch that, the pumpkin plant has taken over and wended it’s way across the patch, over the deck stairs and back down into the grass (can you say, “Feed Me Seymour?”), and if it’s possible, my parsley, sage, thyme, basil and chives are producing too much! One should only be so lucky, right? So I had the pleasure of going out to the garden first thing this morning and while the kids munched on their breakfast outside on the deck. To my delight there were tomatoes aplenty to pick! I actually made a tomato and cucumber salad tonight, simply tossed in olive oil and balsamic vinegar. When the tomatoes are this fresh, there’s no need to dress them up. The freshness speaks for itself. Ialso took cuttings of the herbs into the office the other morning to share with my co-workers. 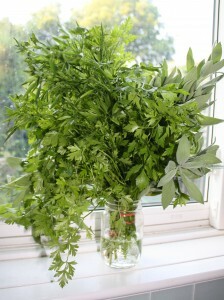 I’m not sure everyone likes cooking with fresh herbs, but they are there for the taking. Might as well share the wealth.